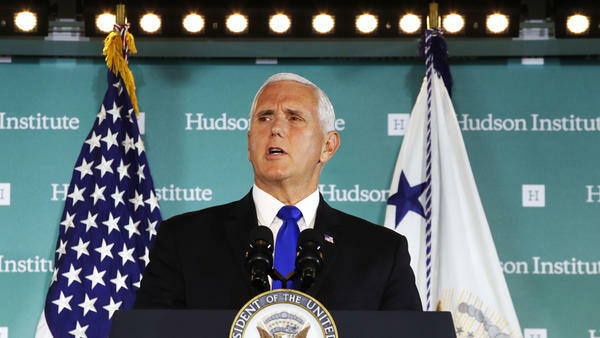 Vice President Mike Pence speaks Thursday at the Hudson Institute in Washington, D.C. The Trump administration is accusing China of trying to interfere in the U.S. political process in an effort to undermine the president and his agenda in the upcoming midterm elections. In a speech to the Hudson Institute on Thursday, Vice President Pence amplified the charge leveled by President Trump last week. Pence said China has used covert actors, front groups and propaganda in an attempt to sway U.S. public opinion. "To put it bluntly, President Trump's leadership is working, and China wants a different American president," Pence said. "As a senior career member of our intelligence community recently told me, what the Russians are doing pales in comparison to what China is doing across this country." The vice president pointed to an advertising supplement that China ran in the The Des Moines Register, which he said "cast our trade policies as reckless and harmful to Iowans." The administration has imposed tariffs on some $250 billion worth of Chinese exports. China has retaliated with tariffs of its own on products such as soybeans and pork. Those tariffs have taken a toll on farm states like Iowa. Other countries have also responded to the administration's aggressive trade policies by imposing tariffs on U.S. farm products, in hopes of swaying public sentiment in rural states that were central to Trump's election. But the administration argues China's efforts go further than other countries'. "It's not that other countries don't hire lobbyists and that sort of thing," national security adviser John Bolton told reporters hours after Pence's speech. But, he added, "I've never seen anything like the scope of the Chinese activities." Officials said they were hesitant to reveal more for fear of compromising intelligence gathering. "Much of what we know remains classified," Bolton said. "If we could declassify more information, I think it would help facilitate people's understanding of the nature and scope of this threat." The vice president's charge of election interference was part of a broader indictment of China's growing power and assertiveness. "America had hoped that economic liberalization would bring China into a greater partnership with us and with the world," Pence said. "Instead, China has chosen economic aggression, which has in turn emboldened its growing military." He pointed to a skirmish earlier this week in the South China Sea in which a Chinese navy vessel came within 45 yards of a U.S. warship on a routine mission to protect freedom of navigation. "Despite such reckless harassment, the United States Navy will continue to fly, sail and operate wherever international law allows," Pence said. "We will not be intimidated and we will not stand down." Pence complained that China's outward aggression is matched by increasing authoritarianism at home, including a crackdown on religious freedom. The administration has responded not only with tariffs on Chinese exports but also with new restrictions on Chinese investment in the U.S. and a military buildup of its own. At the same time, Pence said Trump continues to forge a "strong personal relationship" with Chinese President Xi Jinping. He noted the two leaders have worked closely together on a variety of issues, including efforts to rid North Korea of its nuclear weapons. China's ambassador to the U.S., Cui Tiankai, told Morning Edition there's room for the two countries to work together in other areas. "Between any two countries — maybe especially between China and the United States — there is a certain degree of competition," Cui said. "But there's also a much larger need for cooperation. This is also the reality in today's world." Cui recalled meeting with Pence when the vice president was still governor of Indiana. He said Pence was a strong supporter of people-to-people exchanges with other countries. "The local people, they were so enthusiastic about such cultural events," Cui said. "Why should we cut off all these ties, all these natural ties between the two peoples?"